In late September, on the night of the first Presidential debate between Hillary Clinton and Donald Trump, I made the anti-social decision to pass on an offer to grab drinks and watch at my friend’s apartment. Instead, I chose to watch alone in my bedroom with a screen fixed to my face. That decision, however, wasn’t too anti-social since I’d chosen to attend a virtual reality watch party hosted by Altspace, a VR startup that hosts these types of social experiences. When I plugged into my headset, I was taken to a video game version of New York’s Rockefeller Plaza, where a collection of avatar people were wandering around waiting for the candidates to show up on a giant screen suspended over 49th Street. The experience wasn’t anything mind blowingly crazy — it was just people standing around New York watching a political event on TV. What was mind blowingly crazy was how much it felt like I was actually standing around in New York watching a political event on TV. While it turns out that watching debates on noiseless streets is not generally a sweet experience (in VR or not), the whole thing taught me two lessons about the future of VR entertainment. Above: Watching a live presidential debate at virtual Rockefeller Plaza. The first lesson is the quite obvious fact that VR is better with friends. During the debate, I came down with a rather distressing case of FOMO, knowing that my friends were somewhere sharing hilarious Twitter comments and generally mocking the U.S. political process. Companies like Altspace and others know this and are working to make their VR experiences ones you can share with your friends. (I don’t have any relationship with Altspace, by the way, it’s just the best example currently of a company doing social VR.) The first time I stumbled into how real that can feel was weeks later in EchoSpace, a VR dance party Altspace hosts on Wednesday nights. While moving around the video game nightclub, I bumped into my friend Mike (for now, the only other person I know who routinely hangs out in VR), and the ability to feel that this was actually him was stunning. Although Altspace only makes a few generic-looking avatars available to its users, I could tell from the way this particular avatar moved their hands and tilted their head, that this was distinctly Mike. If simply hearing someone’s voice and seeing a few body-tracked mannerisms is enough to convince my brain that I’m hanging out with someone I know, I can only imagine future social VR experiences that build on that sensation to make me believe I’m actually hanging out with friends. The second lesson the VR debate taught me helps answer a question a media executive recently asked me: How the hell can a media company make any money with virtual reality? There’s already an emerging contrast between those startups co-opting the conventions of today’s media business (and simply attaching VR) and those building experiences with VR as a social communication tool in mind. For example, no matter how cool it is to sit courtside in VR (and it’s cool! ), I’m not likely to spend much time watching NBA games broadcast into an isolating headset if I’m far from my Twitter and friends. I would, however, pay for a ticket to visit a VR sports stadium if I could be there with them. Take more traditional entertainment like late night talk shows. Anyone who has enjoyed attending a live taping of something like the Daily Show is sure to enjoy tech journalist Will Smith’s new virtual talk-show experiment, FooVR. The experience of watching The Foo Show, which invites game developers on to showcase their creations, is far more like showing up to a studio taping of a talk show than watching one on a screen at home. What makes Foo stand out is that viewers can physically move about and pick up objects inside whichever videogame space is on hand for that episode. Smith has created an interactive “place” you can visit rather than mere content to be consumed. And soon, hopefully, I can visit with friends. 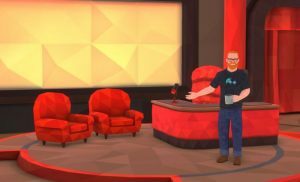 Altspace has also been venturing further into social VR entertainment by hosting performances from popular standup comedians like Reggie Watts and Duncan Trussell. Until now, a key limitation was that there was no way to record and playback these experiences. As a user, that means if you couldn’t get to a headset at the right time you’d miss the show. But expect to see new systems soon that let entertainment companies record performances and schedule opportunities for anyone who missed them the first time. Altspace, for example, announced a new system this week called VR Capture that will enable this kind of recording and playback. With this capability, users can come back and relive recorded experiences as if they were there. This means that once more of my friends are using VR, we’ll have control over scheduling where and when we want to meetup for these shows. With VR’s ability to record real experiences for later consumption, something that would be an impossibility in the real world, virtual reality entertainment will be built on social events rather than merely consuming content alone. The VR entertainment business, then, is not likely to fit neatly into current advertising-based models for broadcast and distribution. Media and entertainment businesses may still make money producing content that users of VR might consume, but if it can’t be consumed socially, it may not be much of a business opportunity. Aaron Frank is Principal Faculty at Singularity University, where he lectures on augmented and virtual reality. He is also a technology writer with articles in Vice’s Motherboard and WIRED UK. Follow him on Twitter: @aarondfrank. This post originally appeared on VentureBeat.